At this point in time, all I have is this poor repro of my contribution to the Artist's against the War show. For a better look at the ugliest elephant ever drawn (my infamous claim) you'll just have to turn out to the opening Wednesday evening. See you there!!! David, I was very moved by this piece when I saw it on the web-site. One of your best. That worn out, decrepit, wrinkled, scaly elephant says it all....BRAVO. And the skeletons dancing in the blood that is Iraq....brilliant! Frances', yours and Marshall's are my favorites in the show. I can't wait to see the original. BEST chinese red of the day, david! Strong piece David. I look forward to seeing it (and you) on Wed.
Great piece, David. Wish I could make the show, but I'll be thinking of you guys on Wednesday. Very cool, Dave. Great to see your art on Drawger again. 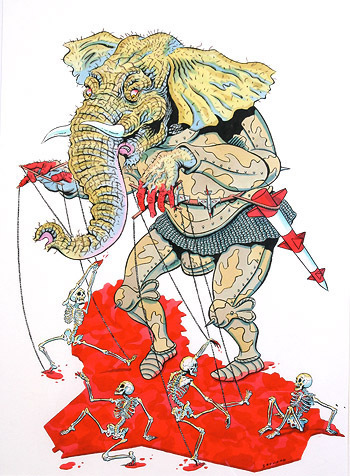 Not sure if it is the most feculent-evil GOP elephant I ever saw, but it is up there. Kind of a J. Ensor vibe going on in the picture. Good to see you back a' blogging.